A new ternery hut which consists of living accommodation for a summer resident warden on a sensitive wildlife site off the North Norfolk Coast. The building is an ecologically sound design which uses high levels of insulation both recycled newspaper and sheep’s wool. Due to the remote nature of the site the building has to be self sufficient and incorporates solar panels for generating electricity and rainwater to supply the shower room and kitchen. There is a composting toilet and waste water is filtered through a reed bed. The building is timber framed with untreated Welsh sourced Western Red Cedar cladding. The mono-pitched roof recreates part of the landscape on which the building sits and is intended to provide additional wildlife habitat. 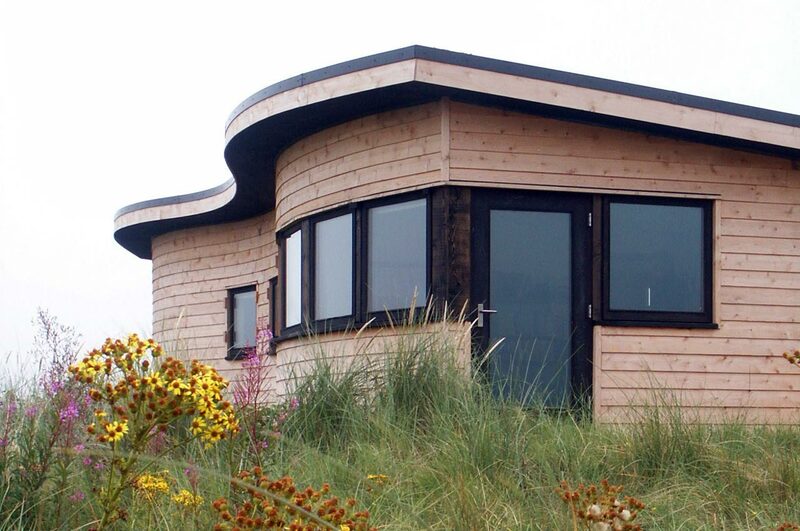 The low profile of the building set back against the sand dunes provides shelter from the winds as well as helping to disguise its form. The undulating wall to the exposed elevation reflects the nature of the shifting sand dunes and coastline in this unique stretch of wilderness.